Clayton real estate is mostly made up of established and older homes and have many gorgeous architectural styles. The single family homes offer floor plans with 2 bedroom, 3 bedroom or 4 bedroom options. Clayton MO homes for sale range in price from approximately $300,000 to approximately $555,000. The median home price in 2014 was approximately $370,000. Residents of Clayton MO real estate enjoy the numerous shopping boutiques, art galleries, jewelry stores and European style cafes. Clayton is home to the St. Louis Art Fair which draws in over 150,000 visitors every year and is praised nationally as one of the best. One of the most appealing features of Clayton is the central location. Minutes from Downtown St. Louis, Forest Park, Lambert International Airport is just 12 minutes away! There are 11 parks located within Clayton, the largest being Shaw Park with over 47 acres of treed and open grass areas. Shaw Park most recent improvements include over a mile of new walking paths and an adult fitness area. Shaw Park is also home to an outdoor Aquatic Center, which provides something for everyone in the family including a 50-meter competition pool, as well as a diving pool, and a splash and play pool for young children. You will also find one of the last remaining outdoor Ice-Skating Rinks in the area. Other Shaw Park amenities include 10 tennis courts, nine ball fields, three playgrounds, and two sand volleyball courts. Clayton welcomes families with its award-winning public school system. The Clayton School District is one of the nation’s best with 95% of its high school graduates going on to college. The majority of classroom teachers have more than 16 years of experience and 93 percent hold a master’s degree or higher. They have a generous support system including resource teachers, interns and general education staff. Each school has a library that exceeds the national standards and a full-time librarian. Clayton is also home to several esteemed private institutions, including Fontbonne University, Washington University, and Concordia Seminary. If you’re interested in learning more about the homes for sale in Clayton MO, please contact St Louis County real estate expert, Sharon Colona and St. Louis Realty for a professional and simple buying or selling process. Call (636) 397-7653 or email at scolona@stlouisrealty.net. Clayton at it's very best! Immediately upon arriving at this sophisticated townhome you are enveloped by the impressive architecture, lush gardens, beautiful side yard, and stunning pool. A generous entry welcomes you to the appealing open floor plan which offers incredible, unmatched views of the Clayton skyline. The living room and dining room are exquisite and are serene enough for relaxing quietly or entertaining guests. The kitchen and family room are well appointed with eat-in space and a butler's pantry. The elevator allows you to easily travel down to the recreation area, complete with a handsome bar, or to the impressively spacious master suite and bedrooms. Additional special features include: a large 4th story deck with unbelievable views, a sauna, steam shower in the master bath, full bath with walkout access for the pool, and much more. A special property with the convenience and walkability of city living with the quaint quietness of an established neighborhood. This one of a kind Mediterranean style home in Claverach Park sits on a beautiful corner lot. Meticulously maintained, a combination of history, charm, and elegance highlight this residence. Original Terrazzo floors adorn the entryway, dining room, and living room. Relax on the second-floor balcony and admire the view of the great room with vaulted wood beamed ceiling, the bay of leaded glass windows and spectacular limestone fireplace. The unparalleled craftsmanship is evident through the oak leaf and acorn medallions that line the dining room ceiling. Natural light floods the expansive, updated kitchen that overlooks the pool and covered patio. The spacious master suite offers a large custom walk-in closet, plus a marble lined ensuite bath with jetted tub, separate shower, double sinks and heated floors. Convenient 2nd floor laundry room. Main floor bedroom suite is perfect for guests or in-law quarters. Your best life begins with a home that inspires you. Find your inspiration here. You will love this stunning center hall colonial, with a transitional flair, in Old Town and walking distance to downtown Clayton. The beautifully renovated eat-in kitchen is equipped with top of the line appliances from Wolf, Sub Zero, and Fisher Paykel. It's open to the family room addition featuring a wood burning fireplace and built-in bookcases. Doors from the family room lead to private bluestone patio with fountain and a flowering, mature vine growing on a arbor. This spot is the perfect place for entertaining. The gracious living and dining rooms complete the main level as well as the butler's pantry with wet bar. Upstairs the elegant master suite is complete with a relaxing sitting room, office with built-in desks and ensuite bathroom. Two additional bedrooms share the hall bath. The lower level rec room has access to a full bath, it is currently being used as an additional bedroom. Close walking distance to Taylor Park. Seller is excluding chandelier in the dining room. Simply a show-stopper in one of Clayton's favorite neighborhoods. This 3-story, 5+ bedroom home combines elegant architecture with up-to-the-minute finishes for today's lifestyle. With gleaming hardwood floors, 10-ft ceilings, Palladian windows and exquisite millwork, this home is spectacular. Its center hall floorplan is dominated by a graceful staircase with historic architectural details throughout. The stunning, eat-in kitchen has received a sophisticated renovation, and the living and family rooms are perfect for family and guests. The second floor master suite boasts a fabulous, renovated master bath, walk-in closet & large sunroom/office that could be used as the master bedroom. Two other second floor bedrooms are bright and inviting, and a third floor bedroom suite includes bonus sitting room and breathtaking views. A partially finished lower level provides additional play space, & a well-appointed wine room & 2-car garage complete the layout, with Clayton schools nearby. Exquisite southeast facing space with the largest outdoor terrace in the Maryland Walk - this hand-painted terrace coupled with abundance of windows on the 11th floor offers an unobstructed backdrop to this sophistically renovated space that is unlike any other in Clayton contention. Thoughtfully crafted improvements and inviting interiors speak sophistication, functionality and style in this 2 bedroom home with over 2,400 sqft of living space. Gorgeous new hardwoods throughout with newly opened kitchen that impersonates only the finest in cooking and entertaining alike - all new stainless Viking appliances in kitchen open to a masculine bar, DR, LR and terrace with plenty of space for the music enthusiast. A truly exquisite space for the sophisticated, offering a simple lifestyle with an upscale urban vibe! Assigned parking spots #224 & #229 on G2 & prof organized storage unit on the 11th floor #11s3 (a rarity)! See improvements list. Available to show March 8th. Exquisite southeast facing space with the largest outdoor terrace in the Maryland Walk complex - this hand-painted terrace coupled with the abundance of windows on the 11th floor offers an unobstructed backdrop to this sophistically renovated space that is unlike any other in Clayton contention. Thoughtfully crafted improvements and inviting interiors speak sophistication, functionality and style in this 2 bedroom home with over 2,400 sqft of living space. Gorgeous new hardwoods throughout with newly opened kitchen that impersonates only the finest in cooking and entertaining alike - stainless Viking appliances in kitchen open to a masculine bar, DR, LR and terrace with plenty of space for the music enthusiast. A truly exquisite space for the sophisticated, offering a simple lifestyle with an upscale urban vibe! Assigned parking spots #224 & #229 on G2 & professionally organized storage unit on the 11th floor #11s3 (a rarity)! See improvements list. A fantastic opportunity in popular Davis Place, this move-in ready home boasts nearly 3,000 above ground square feet. Main level includes formal living room with stone hearth, formal dining room with French doors to deck and yard, renovated kitchen with breakfast bar, huge family room with attached sunroom/home office and powder room. Second level has 3+ bedrooms (original 4th bedroom is currently used as a huge master bedroom closet) including a private master suite with luxuriously renovated bathroom with oversized custom shower and separate air jet tub, large second and third bedrooms, and another renovated bathroom. Lower level recreation room is big enough for a full-size ping-pong table! Property also includes a recently constructed 3 car garage with a 770 square feet carriage house apartment above fully equipped with a fourth bedroom, living room, full bath, full kitchen and laundry room - perfect as a mother-in-law suite, college student residence, or remote home office. It x2019;s not often a home from 1936 stands the test of time and is turnkey ready for today x2019;s lifestyles. As you enter 8037 Daytona you x2019;ll be greeted with architectural details and craftsmanship melded with a more contemporary layout almost impossible to find without building new. Few houses in Clayton boast a kitchen and great room of this quality and size. While cooking from your Viking and Dacor equipped kitchen, you can watch the children study, relax by the fire, or sip a cocktail with guests perched from the enormous center island. If you desire a more peaceful retreat, you can curl up by the second fireplace with a good book in the family room, or have space to work from home upstairs in the office. Continuing on the second floor, a bright and airy master suite with walk-in closet awaits, and a laundry room, four other large bedrooms, and two full baths round out the house. With TWO garages, and in walking distance to all Clayton has to offer, there is no reason to look elsewhere! Architecturally stunning Spanish Revival home in sought-after Claverach Park. From the moment you enter this unique home, you will be enthralled with the dramatic living room with a 21 x2019; ceiling graced with beamed trusses, wood-burning fireplace, etched art glass & 6 sets of arched french doors, one leading to a covered porch. The dining room is elegant with a wrought iron decorative gate & french doors. Gorgeous terrazzo floors. Newly updated kitchen with granite counters, gas stove, walk-in pantry & breakfast area. Off of the kitchen is a family room with doors that lead to a new, expansive patio & the private backyard. Main floor master bedroom suite featuring a large walk-through closet & a master bathroom with a skylight, granite topped dual vanity, tub & separate shower. 2nd full bathroom on the main level. Upstairs are 3 bedrooms, a large bathroom with vitrolite tile & an upstairs deck. An abundance of light streams into this home with most rooms having 3 sides of windows. Beautifully maintained and stunning 2nd story residence located in the urban center of fabulous Clayton. Providing a rare welcome feature, this lovely mid-level condo is one of only two units in Brighton Way that is accessed by a private elevator direct to the unit. The open layout and fabulous kitchen lends itself to a host of activities; enjoy an intimate dinner party or master the perfect chocolate dessert. If uncertain about what to cook, a short walk north takes you to St. Louis x2019; own local grocer, Straubs, and a quiet stroll south takes you to the incomparable Shaw Park...picnic anyone?? Distinctive Palladian windows allow plenty of light inside and the Juliet balconies are equally striking from the interior or exterior. The gas fireplace is a special bonus along with the custom-made bookcases in the kitchen. From your secure garage, load the packages or groceries and up you go. The covered outdoor balcony rounds out the terrific features of this midtown Clayton condominium. You can't beat this location! 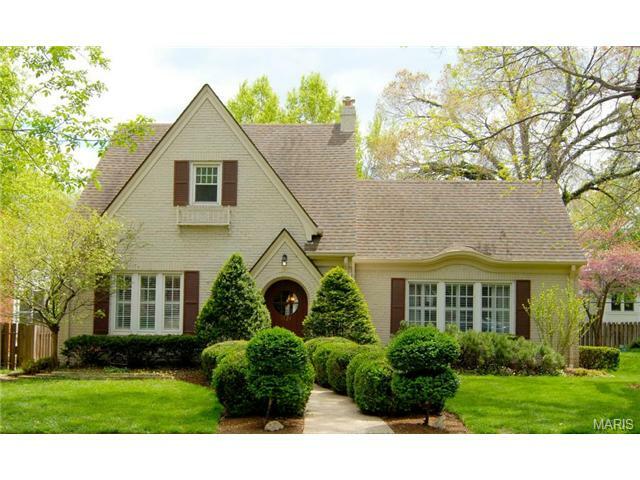 This classic Tudor style home maintains many of its original features while providing the living space desired today. With 3450 sq ft, this stately Clayton home also features incredible outdoor entertaining space! Once inside, you x2019;ll love the natural light, handsome fireplaces, extensive moldings & original built-ins. Fit for any size celebration, the dining rm enjoys a south facing bay window & dual corner cabinets. The main floor family rm provides perfect access to the outdoor x201C;hidden garden x201D; w/an expansive terrace accommodating multiple seating/entertaining spaces. A guest bedroom & cozy den complete the 1st floor. Gorgeous French doors lead to the 2nd floor lounge, currently part of a 4 room master suite. A 2nd gas FP & office nook are welcomed features in this room. Two additional bedrooms share the upstairs. Worried about storage, there are 13 closets! A new roof & gutters plus updated HVAC are welcomed improvements! Gorgeous condo in the coveted Clayton Park Place Condominium in the heart of Clayton. This striking mid-rise building in brick & stone is conveniently nestled in a secluded, private location across from Shaw Park with panoramic views of the park and surrounding skyline. Enter this home from a short half flight up off street level to find a unit designed & finished with attention to every detail. Enjoy an open floor plan with 9 x2019; ceilings, gourmet kitchen w/Wolf & Bosch appliances, breakfast bar, living room with fireplace & dining area, all open to the oversized covered/private terrace. Completing this property are two lovely bedrooms, master bath w/Jacuzzi tub & heated floor, guest bath w/heated floor, powder rm & laundry rm. Included are 2 parking spaces in the heated garage, elevator to all levels, additional private storage. With only 2 entrances per floor, this prestigious residence building is known for its solitude & privacy. See attached detailed list of features & improvements.